On a field, barry wavy, of ten white and blue; a cutlass and a fighting axe in saltire, gold. 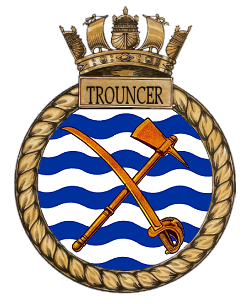 TROUNCER: A member of a 17th century naval boarding parity, known as ‘TROUNCERS’. This design depicts their weapons. HMS TROUNCER alongside a pier at Portland, Oregon on February 9th 1944, soon after completion. Photograph from the Bureau of Ships Collection in the U.S. National Archives (#19-N-61366). Laid down 1 February 1943, at Seattle-Tacoma Shipbuilding Co. Tacoma, Washington, a C3-S-A1 type freighter, Maritime Commission hull number 258; Seattle-Tacoma hull number 42. The hull was purchased by the US navy to be the USS PERDIDO ACV-47 (later changed to CVE-47 on July 15th 1943). She was launched on June 16h1943 by her sponsor Mrs. H.M. Bemis. Her hull was towed to the Commercial Iron Works yard, Portland, Oregon, for completion and fitting out as an aircraft carrier. Whilst still under construction it had been decided that ACV-47 was to be transferred to the Admiralty on loan on her completion; she was assigned to the United Kingdom under lend lease 23 June 1943. She was transferred to the Royal Navy on 31 January 1944 and commissioned in RN service, at Portland, as HMS TROUNCER (D85), Commander R. B. Cooper RN in command. After completing her builder's sea trials and her acceptance by the Admiralty TROUNCER sailed to Vancouver, Canada to be modified to meet Admiralty requirements, receive her full crew compliment, complete sea trials and work up ready for beginning her active service. This work was undertaken by the Burrard Dry Dock Co. Ltd., North Vancouver, British Columbia, HMS TROUNCER arrived there on February 21st 1944. CVE-47 returned to Norfolk, Virginia, 21 February 1946, and was returned to U. S. Navy custody 3 March 1946. 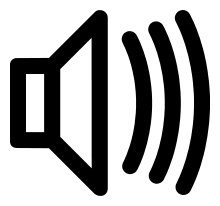 Authorized r for disposal 25 March 1946, and struck from the RS Naval Register 12 April 1946. She was sold to William B. St. John and delivered to her purchaser 6 March 1947. Reconstructed as a merchant ship and renamed Greystoke Castle for the Lancashire Shipping Co. Ltd. (Molers Ltd. managers). Renamed Gallic in 1954, further renamed Berinnes in 1959. She was scrapped in Taiwan starting November 1973.